Why are you focused on tech jobs this year? As part of an effort to train local talent to keep L.A.'s tech economy thriving, Mayor Garrett recently launched the Special Committee on Tech Talent and Training as part of the Mayor's Tech Council. The Committee is made up of local technology industry leaders, including companies such as Snap Inc., Cornerstone OnDemand, Upfront Ventures, Honest Company and Dollar Shave Club. Mayor Garrett asked Sean Arian, our co-founder and president, to chair the Committee, and for the Bixel Exchange to support the placement of 100 interns this summer. Bixel Exchange is hosted at the Los Angeles Area Chamber of Commerce. We work with the tech community to develop career pathways to tech jobs for low-income and diverse students in Los Angeles. Our goal is to introduce 10,000 low income Angelenos to the technology industry in the next year. 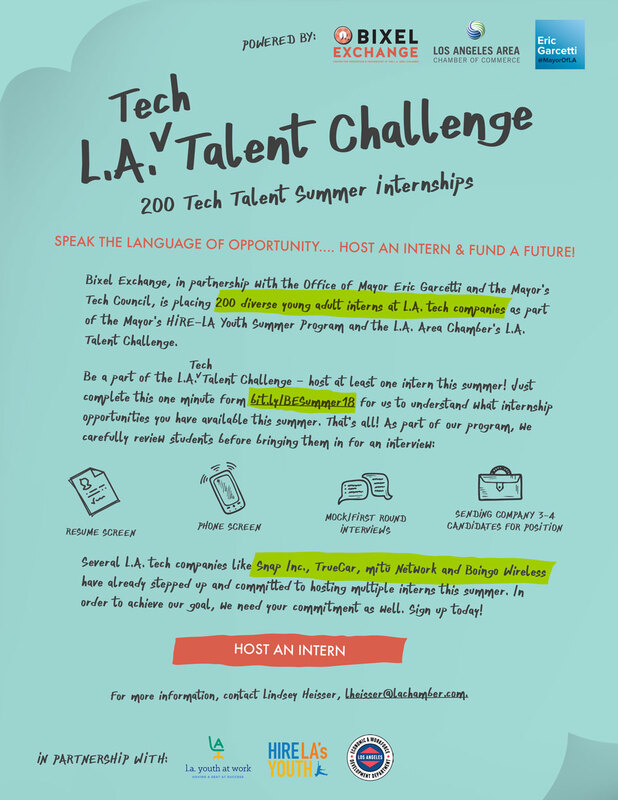 What is the Mayor's Office's Hire LA's Youth program? Mayor Eric Garcetti announced a new goal to hire 20,000 young people for year-round employment by 2020, more than quadrupling the number of youth jobs coordinated by City Hall when he entered office. A summer job is key in helping young people ages 14 to 24 learn about the workplace, find a mentor and enter a path to meaningful and lifelong employment. HIRE LA's Youth is an investment that pays off in lives today and holds the promise of a brighter future for our city and the entire region. Learn more. Where do these students come from? How do they get to Bixel Exchange? Our students come largely from L.A. area community colleges and are studying one of three pathways: IT, Software Development or Design/Media/Visual Arts (graphic design, digital media, content creation). Most of our students come recommended by their professors. We've never worked with this student population before. How good is this talent pipeline? This is an untapped and diverse talent pipeline. In summer 2017, we placed 100 community college students in paid tech internships. Thirty percent of the candidates have secured part- and full-time positions as a result of their internship. Read more. What kind of experience will these students have before I meet them? Students are coming to us from some of our partner schools that are focused on developing educational pathways that expose students to classes in digital media, design, information technology and software development. Bixel Exchange has worked with these teachers and faculty to connect technology professionals to help students make connections between what they're learning in the classroom and its direct application in industry. Students gain additional preparation through mock interviews. The mock interview process allows our team to prepare students for upcoming interviews but also helps us identify which students are ready to participate in an internship experience. Do I get to interview interns before making a hiring decision? Yes. We are just pre-screening candidates for you. You will do the final interview and decide who to hire. How many interns can my company hire? As many as you'd like. Just make sure each intern has a project they can work on and complete over the course of their internship. Can we get a subsidy to pay for our intern? If you choose to move forward with subsidies for your interns, they must meet the L.A. City requirements: age, location, and income level. Bixel Exchange verifies this upfront; however, once a student candidate is selected, we pass their information along to a YouthSource Center, who meets with the students, requests official documents to confirm the reported requirements are true and ensures the student receive their payment from the City. Once the student is confirmed as eligible for the internship, your company will need to complete a Worksite Agreement and an employer training. These documents are to ensure you agree to hosting the student intern, providing sufficient work throughout the internship and provide a safe environment for them to work in. Please note, funding for these internships is dependent upon the City and County Workforce Funds which are subject to change, given governmental funding constraints. Also, these internships require a 3-4 week intern processing period, a work-site location for visitation, and a signed work-site agreement to be allocated by a designated YouthSource Center. Lastly, these internships will start in July 2018. My company doesn't have an official internship program and I'm having trouble with HR. Can you help? If you are unable to act as the employer of record for the interns, we can play that role and have the processing of paperwork go through the L.A. Area Chamber. What activities or projects do students typically participate in during their internships? We want students to have a good experience and be an asset to your team. Your company can choose what project your intern will work on based upon work load and need. We'd like for this to be a great learning experience for our students so we'd recommend outlining a project prior to their placement that aligns with the department they will be interning for. Can I keep my intern if I like them? Yes! Thirty percent of our 2017 summer interns have transitioned into part-time and full-time employment following their internship. How many hours are interns expected to complete during their internship? Most students are available to start as soon as school ends June 19; however, typically students will start their internship early July and are expected to complete a minimum of 100 hours over a 5 week period. We also have some students that will fulfill a two to three month internship. The first 100 hours will be subsidized by the City and the remaining hours will be paid for by the company. Welcome! The first step is to fill out this very simple survey asking a few questions about your needs. Click here to begin.